Squash House Quilts: May Garden and a Winner! Upon returning home from Portland this past weekend, Mr. Squash and I were greeted with an explosion of color in the yard! Our neighbors behind us have an old garage with a very mossy roof. I call it the Mushroom House. It always makes an interesting backdrop. Here is a slightly wider angle. A view down toward the grape vines. I keep saying there is no more room to plant, but I can always seem to find a spot. The trick is to stay near a drip line or a sprinkler. It gets very dry and hot here as the months move forward. We've had a couple of rhubarb crisps and lots of lettuce so far. Look at H. Bernardii! I'm just tickled with how he looks this year! 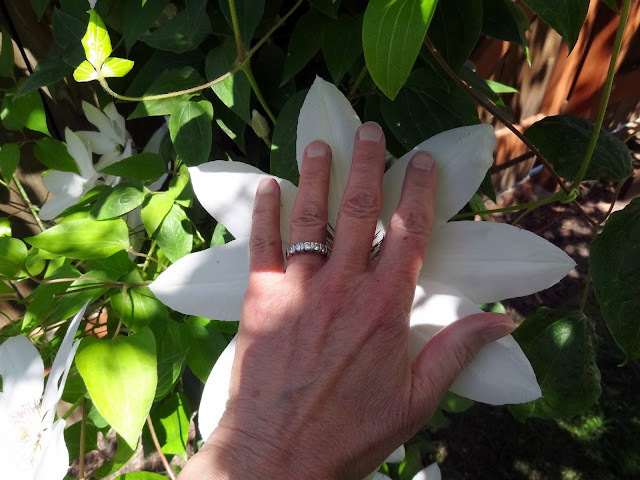 My half Lithuanian hands are not small by any means, so this gives you an idea of the size of his blooms! Barbara looks gorgeous as well! We had a really strong wind the other day and she fell over, but she's staked now and not going anywhere! 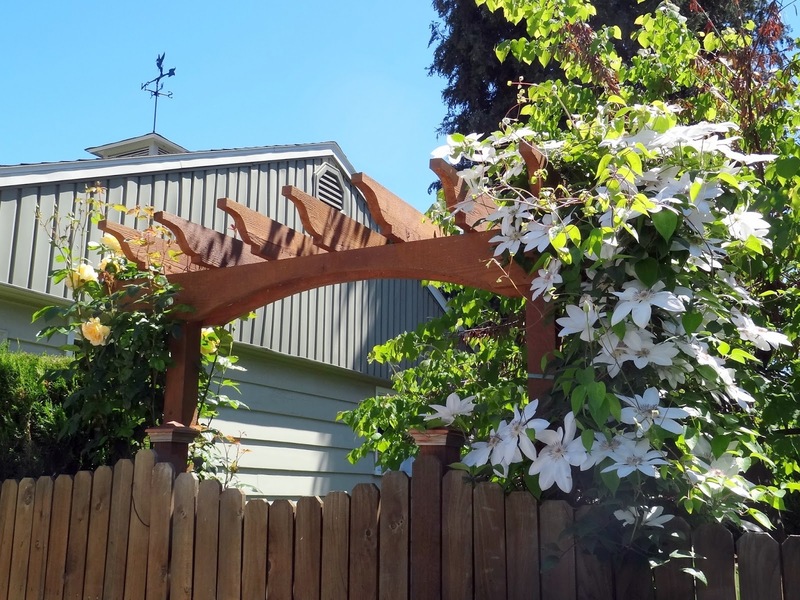 This is the front trellis looking from the driveway. It's finally doing exactly what I wanted! The rose on the left is Scented Heaven climbing rose. Mr. Squash and I are so pleased with the yard. The other day someone was walking by and asked Mr. Squash if he lived here or was in one of the several "wine guest houses" in town! Now that's a compliment! Many thanks to everyone who commented on my last market post about garment sewing. I loved reading your comments and you've all inspired me to get back to sewing a few things to wear! My Random Number Generator, Mr. Squash, picked#17, Gloria, from the UK! She said: "I make all my summer dresses from quilt fabric and have done since I first started quilting. Yesterday, I wore a dress made from a fabric I had bought to back a quilt. Dress or backing - two reasons to buy 5yds at a time....Also, quilt fabric needs less ironing, in my experience, than dressmaking fabrics and can be worn straight from the tumble dryer when on holiday." Congratulations, Gloria! Your yard is just like strolling through a park Candace. Beautiful! Thank you so much for choosing me! What a lovely garden! Your clematis are delightful, particularly the large-flowered white one. The flowers must glow at dusk. And nice to see a garden in sunshine - it is pouring with rain here in my part of the UK. Beautiful Garden!!! 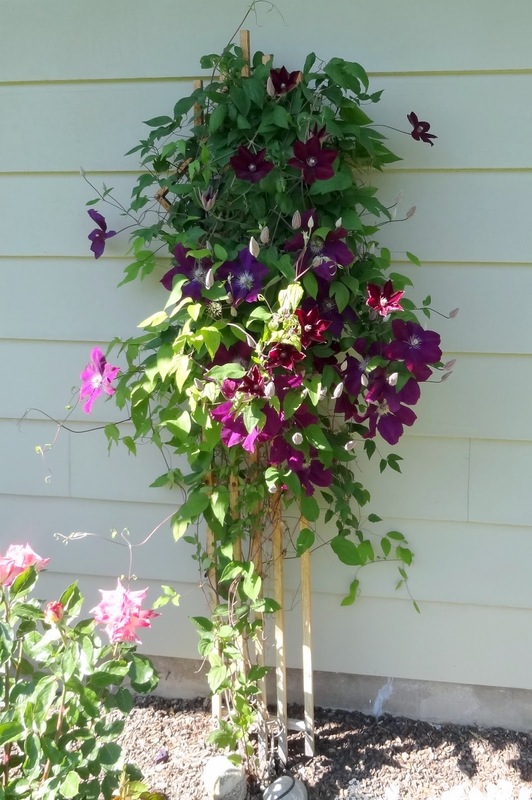 Love your Clematis(s). I live in Ontario Canada and I have a Clematis that is around 5-6 years old and has only ever had 1 or 2 flowers on it. My aunt in Courtney British Columbia is always teasing me because hers has literally 100's of blooms. I can't pull it up and plant another one.. because maybe - just maybe it will have a "stellar" year :-) Love your posts. I don't mind being staked! I find support wherever I can! I loved sewing clothes and just stopped for some reason. Nice creative outlet. It looks just gorgeous. 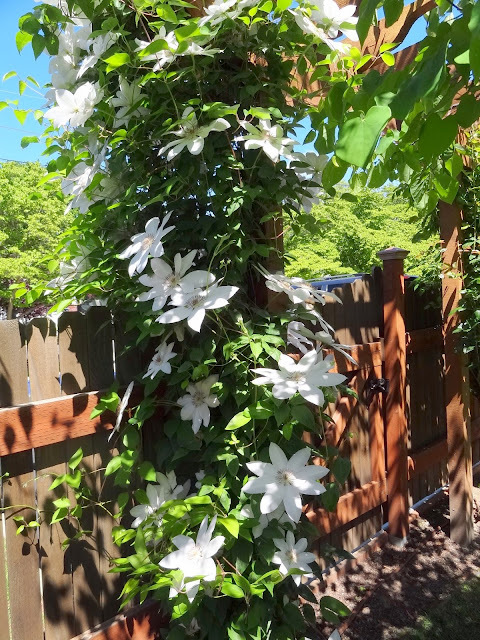 The Clematis are stunning. 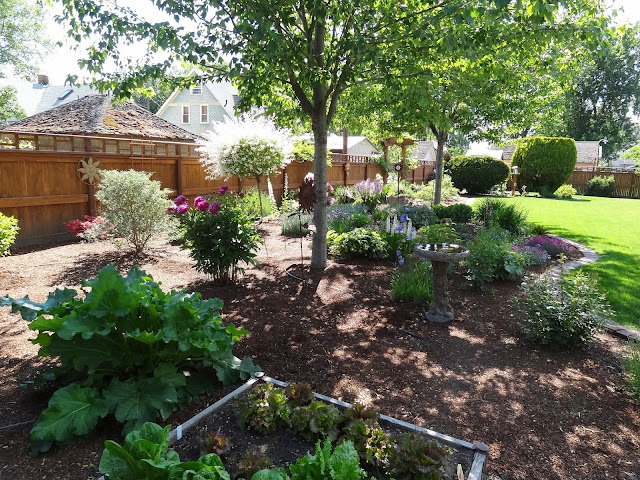 The garden looks wonderful ! What is the tree? I love the way it looks like a dandelion! Everything looks so lush. Your yard is just gorgeous. You must really enjoy spending time in such a beautiful place!! Congratulations to you lucky winner. Such a gorgeous yard! I'd say you should be on a garden tour. Certainly your yard is as pretty as any B & B I've been to. We have purple clematis blooming at the moment and the flowers are huge as well. Wow, your garden is spectacular...mother earth's quilt! Oh, my word, your garden is gorgeous!! I'd be pleased as punch to get that kind of compliment, too. Your garden pics always make me smile! I can't believe how much is in bloom there. We don't have anything blooming yet! It looks fabulous. 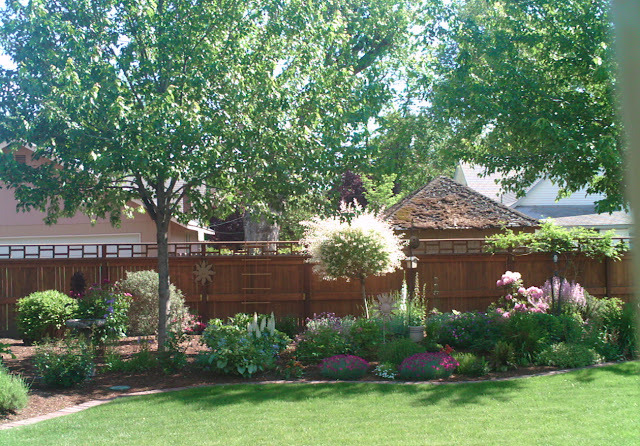 Your yard and gardens are beyond gorgeous! They are every gardener's dream! Beautiful blooms! Your garden is looking very lush and gorgeous! It will be so nice to spend these warmer months here. Have a great weekend! It has been fun watching the Squash House garden evolve. It is so very beautiful, Candance. Great job! 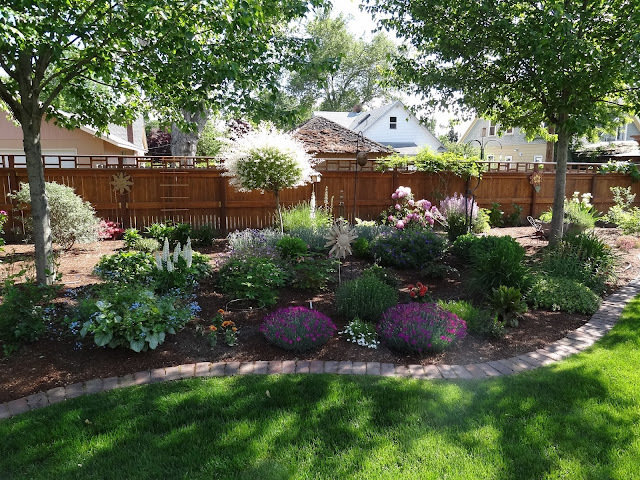 Your gardens are beautiful!!! Seriously, the Squash House needs to be featured in a magazine. WOW! Your yard is gorgeous already! Thanks for sharing. What a great place to spend time - is Miss Sasha allowed to go play in the yard? Our kitties only get to dream about it! 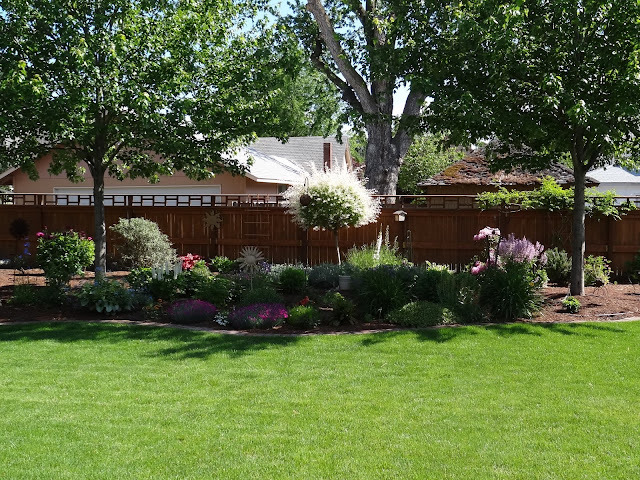 Wow your yard is gorgeous!! I've not seen some of these plants before. A reward for your hard work. Your beautiful gardens look like pages out of a magazine. Just beautiful. Definitely two green thumbs live at your address! So, so pretty! Just lovely!!! What is that round plant in the center that looks like it is full of white flowers? Your garden looks beautiful. Please can you tell me what the white roundish standard small tree is in the centre of the first picture? I came back to leave another comment!!! Seriously, your landscape is amazing. Oh how dreamy! It must be so fulfilling to see this after all the work you put in. Y'all created it!!! !